Norton 360 has been replaced with Norton Security, Learn more about Norton Security here. Norton 360 has all the tools necessary for all around computer protection. This program protects anything that may threat your online safety including; virus protection, spyware and spam protection, parental control management, Identity theft, tune-ups, backups and more. Total Internet security is essential for any computer connected to the Internet. There are very bad people out there that, for whatever reason, want to wreak havoc and damage computer systems. Norton 360 covers all potential threats that are out there giving you the security needed to practice safe computing. The protection categories provide an overall system status. Your status may be Protected if your computer is secure, Attention if a status area needs your attention, or At Risk if your computer is at risk. This area also provides a Fix Now icon when needed. 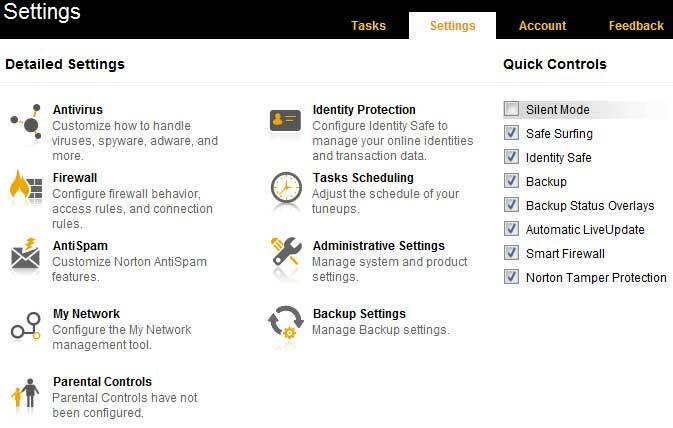 The main interface of Norton 360 displays individual security status for each protection category, such as PC Security, Identity, Backup, and PC Tuneup. Based on the security status of the different components of your PC, the status areas of the four protection categories are marked as Protected, Attention, or At Risk. One click shows the protection levels as shown in the screenshot below. The scan options screen shows all of the different levels of security that can be optimized to suit your needs. There is the Computer Scan that checks for threats and free disk space. The Reputation Scan that checks your programs’ trust levels. 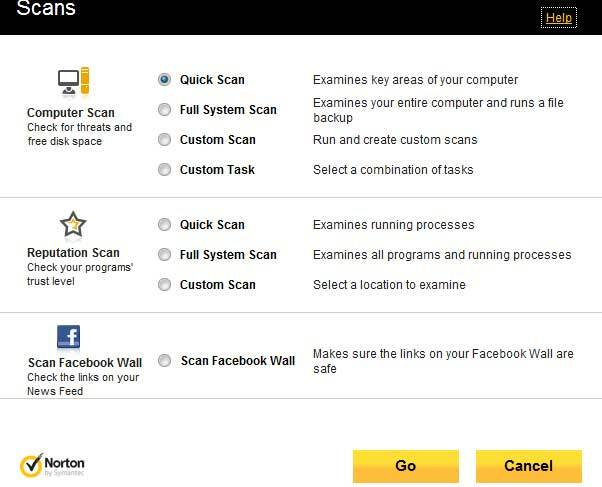 Norton 360 will even scan your Facebook wall to make sure the links on your News Feed are safe. As the screen shot shows, these scans are customizable to do a quick scan, a full system scan or a custom scan. There are detailed settings available to further customize how threats are handled. The categories include Antivirus, Firewall, AntiSpam controls, Network Management, Parental Controls, Identity Protection and Backup Settings. Another very important aspect of this program is the ability to backup your important files either locally or online with 2 Gigabytes of free storage. 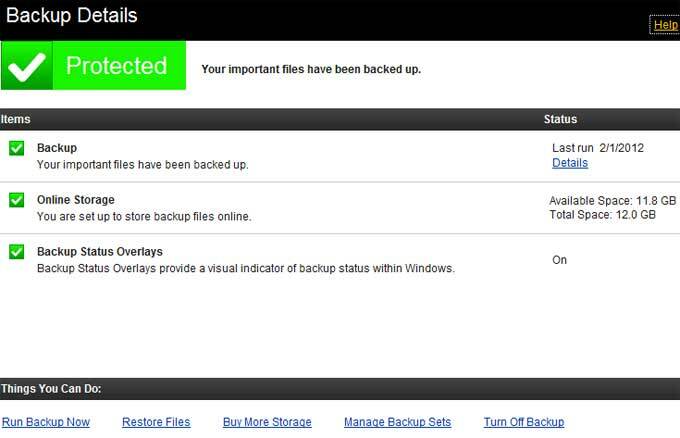 Here is a screenshot of the Backup Details interface. Norton is a comprehensive solution to keep you, your family and your computer system totally protected from the many conceivable threats that may compromise computer and Internet security. 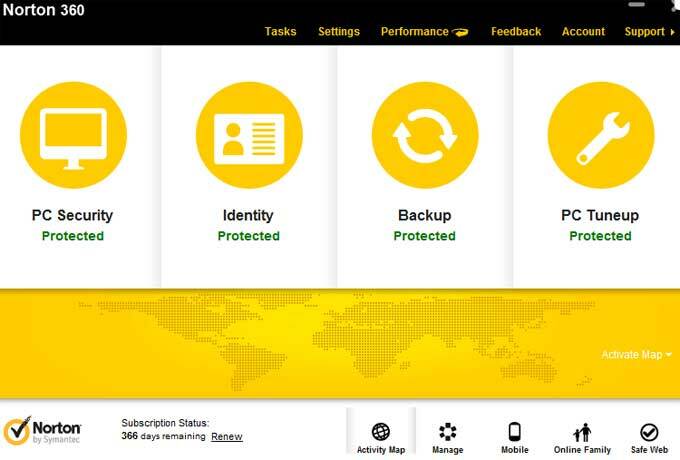 Norton 360 detects and eliminates viruses, stops online threats, defends against online identity theft and safeguards your important data from loss. The redundant protection scenario provides four unique layers of powerful protection that proactively stop online threats before they can infect your computer. This review of Norton 360 barely touches all of the options and safeguards available in the program. The beauty of this software is that you have no reason to know the entire behind the scenes computer protection that is going on at any given moment. All we need to know is that we are protected by a very reputable program that is backed by years of experience in the computer safety industry. This recommended Internet Security Suite will keep you safe and secure with little intervention on your part. Norton Security is, as the name suggests, an all around computer protection system designed to keep your system and family safe while on the Internet. The product utilizes virus protection, family protection by monitoring and blocking harmful sites, identity theft protection and proactive protection. This product runs silently on your computer and constantly protects the PC from malicious attempts that can compromise your Internet security.